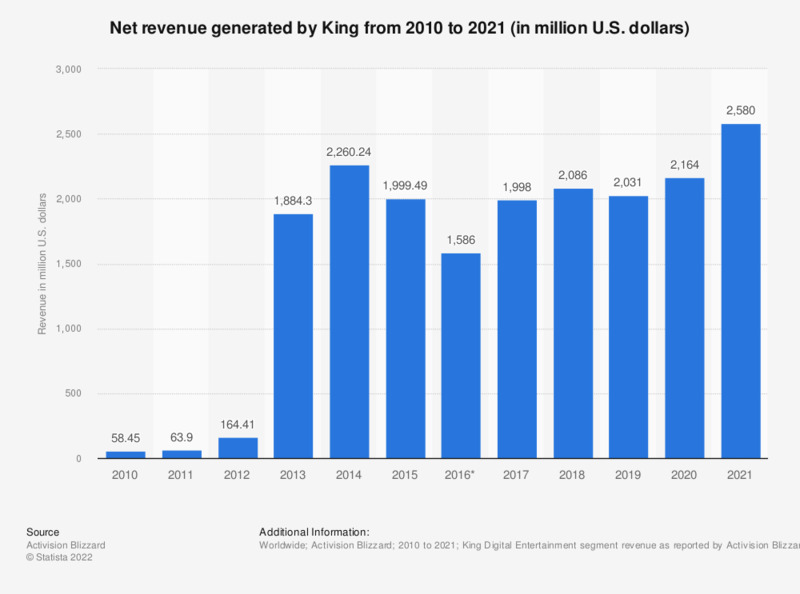 This statistic shows a timeline with the global annual revenues of King.com from 2010 to 2018. In 2018, the company generated 2.09 billion U.S. dollars in revenues, only slightly lower than record high results of 2014, when the revenues reached 2.26 billion. The majority of revenues is generated via in-game sales of virtual items. King's popular titles include Candy Crush Saga, Farm Ville Saga , and as well as Bubble Witch Saga. Candy Crush was in the top ten free-to-play games worldwide based on revenue in 2018. After King's acquisition the company's figures are being reported in Activision Blizzards financial reporting.